Iran's President Hassan Rouhani has left Tehran for Ashghabat Turkmenistan, on March 27 morning, as first step of his regional tour which will later take him to Azerbaijan. President Rouhani told reporters at Tehran airport that strengthening ties with neighbours are among the main policies of his government. Discussing bilateral, regional and international issues are among the main topics of discussion, the state-run IRINN TV reported. Multiple agreements are expected to be signed during the trip. During the two-day visit, Hassan Rouhani will meet his Turkmen counterpart and he will later visit the city of Merv, while the representatives of the private sectors of the two countries will meet to discuss the expansion of cooperation. Rouhani is also scheduled to fly to Baku on March 28 to hold talks with his Azerbaijani counterpart Ilham Aliyev. Bilateral meetings of the delegations as well as signing various memorandums of understanding are among Rouhani’s visit plans. In the meantime, Iran and Azerbaijan will ink a document on cooperation regarding the oil and gas fields of the Caspian Sea. On March 29 an event to discuss the ways for deepening economic cooperation between the two countries will be held. Senior Iranian officials including Foreign Minister Mohammad Javad Zarif and Oil Minister Bijan Namdar Zanganeh are accompanying President Rouhani to the two neighbouring countries. 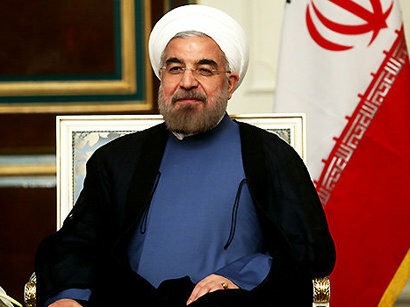 The Iranian president will return Tehran on March 29.